What would it have been like to be a passenger on the Lusitania? How would being a first-class passenger have differed from being in second or third-class? Enter Diagram of a Colossus, and take a first-hand look at the various passenger experiences available on one of history's most majestic lost liners. Photos in Diagram of a Colossus are available courtesy of the Eric Sauder Collection. Sauder Multimedia  Preserving the Past for the Future. Specializing in images from the heyday of transatlantic travel. to the present as well as collateral subjects. 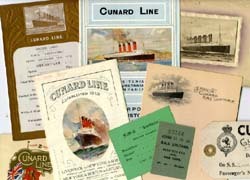 The collection also includes archival and present-day footage, ship's plans, artifacts and memorabilia, and period music. The team of consultants at Sauder Multimedia assisted with some of the most thought-provoking investigations of the 20th Century, including many of the best-known maritime disasters in history -- Titanic, Lusitania, Britannic, and Andrea Doria. Among our credits are numerous documentaries appearing on A&E, The History Channel, The Discovery Channel, The Learning Channel, as well as the best-selling books Exploring the Lusitania, The Discovery of the Titanic, Titanic: An Illustrated History, and Lost Liners. No matter what type of ocean liner consultation you need, you can find it here at Sauder Multimedia. If we don't have the information, we have a vast network of experienced Ocean Liner Consultants that we can put you in touch with at no cost to you. was natural that Eric Sauder would become involved in preserving the history of these great ships. Over the past fifteen years, Eric has advised on dozens of ocean-liner-related books and television documentaries, and he is the co-author with Ken Marschall of R.M.S. Lusitania: Triumph of the Edwardian Age. Because of his knowledge of passenger ships of the early 20th Century, Eric was asked by Dr. Robert Ballard to act as Historian for his explorations of the wrecks of the Lusitania and the White Star liner Britannic (sister ship of the Titanic). It was his close involvement with these expeditions that gave Eric a unique insight and knowledge of these great lost ships that is not available through other consultation services. Bill Sauder's first job was as a tour guide on the R.M.S. Queen Mary. After a short time, he was quickly promoted to the position of archives administrator for the ship -- a position he held for several years -- while specializing in the art, architecture, and mechanical workings of the great liner. After the discovery of the wreck of the Titanic in 1985, Bill worked closely with maritime artist Ken Marschall and identified key pieces of wreckage, helping to piece together the final moments of history's greatest ship. Bill has also served as Technical Advisor on Robert Ballard's Lusitania expedition in 1993, and in August, 2000, he joined the month-long expedition to the sunken liner Titanic. In addition, he was a Visual Consultant on James Cameron's Titanic. Bill's specialty is turn-of-the-century naval architecture and marine engineering, which brings a unique knowledge of the workings of the great four-funneled liners to any consultation. To view this interactive you'll need to download Macromedia Flash plug-in or control for your browser.